Survey finds that affordable housing is a major concern among District residents. Washington, D.C., may not be the most expensive place to live in the country, but it can certainly feel like it. Nearly half of renters pay 30 percent of their income towards housing, and nearly a quarter shell out 50 percent. After a Recession-era lull, new construction is going up all over the city center, but it’s mostly in the form of spangly high-rises, which aren’t bringing down housing costs. Meanwhile, affordable stock is in decline. 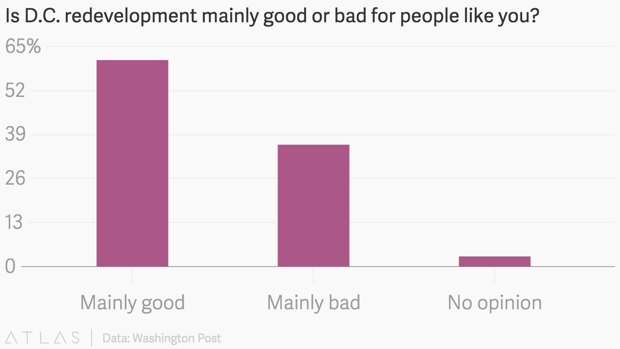 It’s no wonder, then, that a rising share of D.C. residents feel insecure about housing. In a random-sample survey of 1,005 adults conducted by the Washington Post, a majority (56 percent) say that if they had to move tomorrow, they would have to look to the suburbs to find something affordable and appealing. Most residents believe that redevelopment has been mostly good for “people like them.” But 55 percent of African-American respondents, and 56 percent of those who make less than $50,000 a year, feel it’s been mostly bad. Once predominantly African-American, the District has experienced anunprecedented loss of black residents since 2000, partly due to displacement by more affluent, white newcomers. 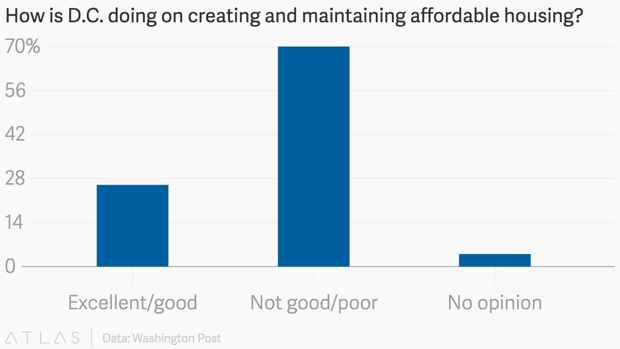 Of all the issues facing the city, affordable housing ranked second among D.C. residents’ concerns (18 percent), just after crime (34 percent). A majority (70 percent) said that city government is doing a “not-so-good” or “poor” job of creating and maintaining affordable housing, and gave the thumbs-down to how the city has attempted to help the homeless. Eighty-seven percent said that they would support the District government spending $100 million per year—about one percent of the annual budget—on affordable housing development. Happily, as of earlier this year, D.C. has directed more money towards affordable housing than ever before. Still, the city has a long way to go to make sure its most vulnerable residents have a stable home.